The chute wrangler is designed to assist recovery of parasail after a line break in high winds. It fits onto the rear riser of parasail, when deployed into the water it should bring the parasail to a slow stop. It fits easily on to any size parasail and can be operated by the passengers or the parasail crew. 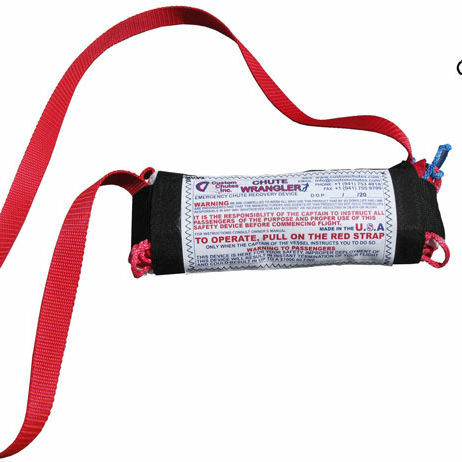 Each parasail requires its own specific Wrangler deflation line, these come in various sizes to fit each parasail. If the Wrangler is accidentally operated it does not effect the flying ability of the parasail, it will just require a controlled water landing. The wrangler is becoming a very popular addition to many operators’ safety procedures, we have sold 200+ and counting. To see the Wrangler in action and how it works visit the gallery to watch the videos.